As with any trade you must have the right tools to complete the job first time, every time. Thats critical especially with fibre optics because if you get the basics wrong it's going to cost you dearly. Firstly and I think most importantly you must have the proper CLEANING TOOLS, because the fact is the majority of faults on fibre optic cabling networks are due to contamination/dust particles on the connector faces or adapters, its as simple as that. So basic common sense such as dust caps on all unused patch cables, couplers & don't forget test equipment will save you a lot of headaches down the line. Other essentials for all fibre cabling technicians is an ample supply of ISO propyl alcohol 99%, lint free wipes and of course a "Cleaning Pen" available for both 1.25mm (LC) and 2.5mm (SC/ST) connectors styles. Quick and easy to use it guarantees a clean connector face up to 800 times. Optical light test set contains both a power meter and an optical light source along with some reference patch cords and will measure the power loss over your mated fibre connectors on the cable link for multimode and singlemode.This affordable kit is essential for providing the result of your fusion or mechanical splice and will be requested by the client on completion of most installations. A visual fault locater is also a great backup tool to have in your kit. This "pen" sized tool is battery operated and is a MUST in locating misconnects, excessive bend radius and breaks in your fibre cables. It works simply by emitting a laser typically 20mw into the connector face and the problem area will show up as a bright red pulse of light, indicating excessive losses, this will be apparent even through yellow or aqua sheathed tight buffered cables. Its generally used in the fibre optic patch panel area where most errors occur from poor splicing and bad connectors. 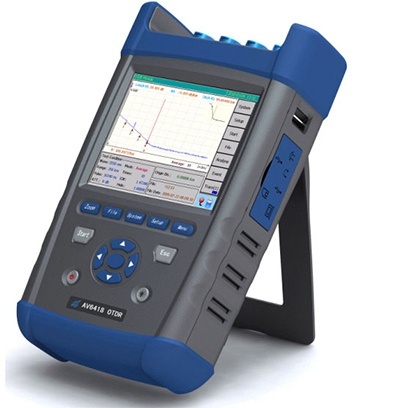 This low cost battery operated tester is used for inspecting damaged or contaminated connector faces. This is normally the first port of call as most problems arise from dirty or damaged connector ends. Ideally it will have a magnification x400 and will easily show up any issues such as chips, cracks and scratches that will render your link unusable. Typically its handheld but desktop units are becoming more popular due to eye safety requirements. Other equipment that may be required should the going get tough is the OTDR (optical time domain reflectometer) This expensive and complex meter sends out a high powered pulse of light and measures the "back scatter" to determine losses and pinpoint breaks on the fibre, as well as map out on a colour graph all of the splices and connectors on the link. It has many advantages as you would expect over the test instruments mentioned above such as only being operated from one end of the fibre link only and it can also show up any manufacturer faults in the fibre. Its generally only used when installers encounter serious test issues with the link.